Mack McAllister has a $600 million dollar idea. His mindfulness app, TakeOff, is already the hottest thing in tech and he's about to launch a new and improved version that promises to bring investors running and may turn his brainchild into a $1 billion dollar business--in startup parlance, an elusive unicorn. Sabrina Choe Blum just wants to stay afloat. The exhausted mother of two and failed creative writer is trying to escape from her credit card debt and an inattentive husband-who also happens to be Katya's boss-as she rejoins a work force that has gotten younger, hipper, and much more computer literate since she's been away. Before the ink on Mack's latest round of funding is dry, an errant text message hints that he may be working a bit too closely for comfort with a young social media manager in his office. When Mack's bad behavior collides with Katya's search for a salacious post, Sabrina gets caught in the middle as TakeOff goes viral for all the wrong reasons. As the fallout from Mack's scandal engulfs the lower Manhattan office building where all three work, it's up to Katya and Sabrina to write the story the men in their lives would prefer remain untold. 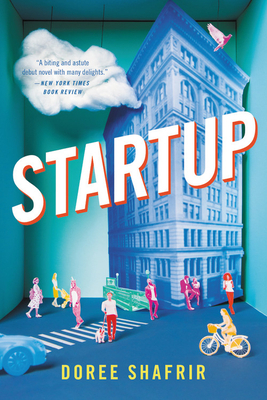 An assured, observant debut from the veteran online journalist Doree Shafrir, Startup is a sharp, hugely entertaining story of youth, ambition, love, money and technology's inability to hack human nature. Doree Shafrir is a senior culture writer at BuzzFeed News and has written for New York Magazine, Slate, The Awl, Rolling Stone, Wired and other publications. A former resident of Brooklyn, she now lives in Los Angeles with her husband Matt Mira, a comedy writer and podcaster, and their dog Beau.